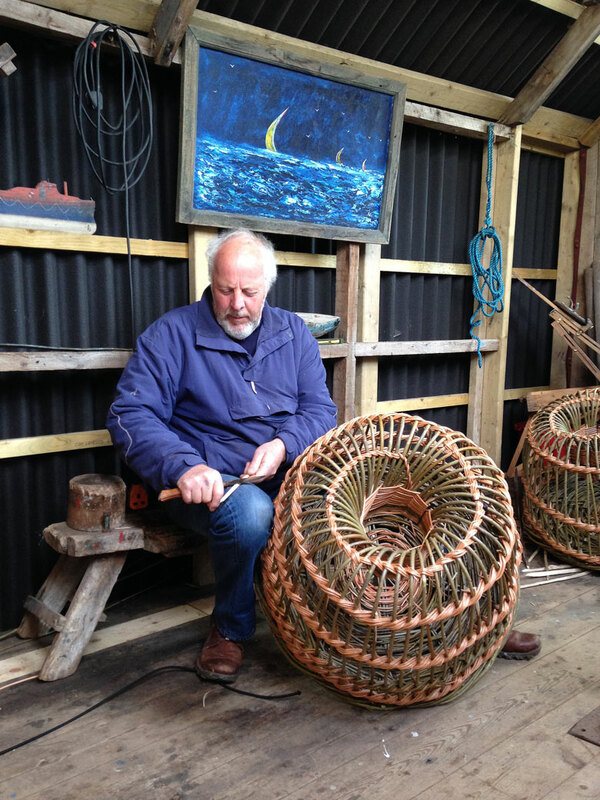 Cornish lobster fisherman Nigel Legge is a master at making traditional wicker lobster pots, once an essential part of his trade, now almost an art form. Alice Wright watches him work. The tiny fishing village of Cadgwith could have been plucked from a storybook. Sheltering in a cove on Cornwall’s Lizard Peninsula it boasts spectacular rugged scenery and chocolate box thatched cottages. But while it may be picture-perfect, it is also very much a working village. Fishermen still go out from the beach most days, bringing back several tons of crab a week, as well as lobster, mackerel, shark and mullet. It is here on the beach that I meet local lobster fisherman Nigel Legge on a beautiful but blustery May morning, before heading back up the hill to the shed he retreats to when he’s not at sea. 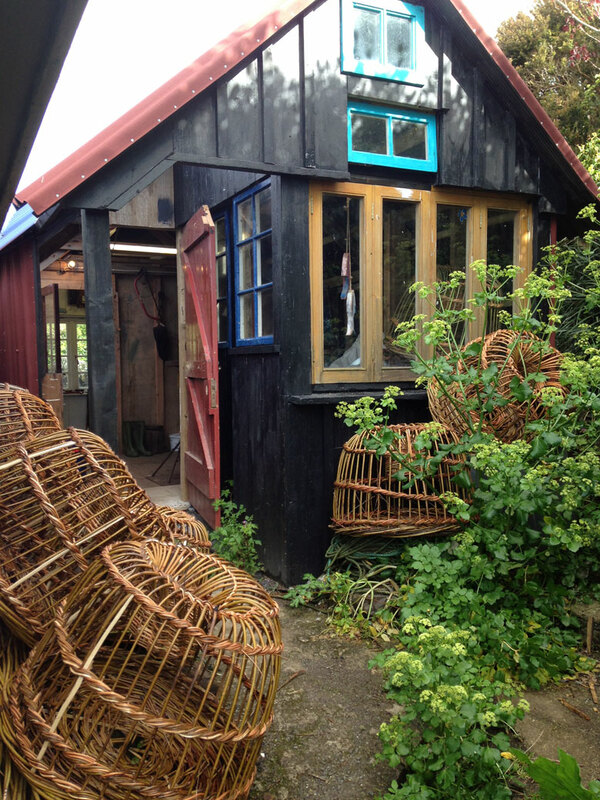 Traditional willow lobster pots are piled up outside and inside bunches of willow are stacked in one corner. For Nigel is one of only a few people in Cornwall, probably the country, who still weaves lobster pots by hand. When he’s not fishing or weaving, he also paints here. His favourite subjects, naturally enough, are boats and the sea. Nigel, who will be 65 this year, grew up in Cadgwith and now lives in the nearby village of Lizard. His father was a fisherman, as was his mother’s father, and when he left school at 15 Nigel had little doubt about what he wanted to do. After a few years in the Merchant Navy to satisfy an urge to see the world he returned to Cadgwith with savings of £1,000. It was enough either to buy his grandmother’s house or his father’s boat. He opted for the boat and has been fishing from the cove ever since. During the summer he’ll usually haul all his pots on Monday and Friday, heading out at about 7am and returning around midday. He might then spend the afternoon taking visitors for boat trips. 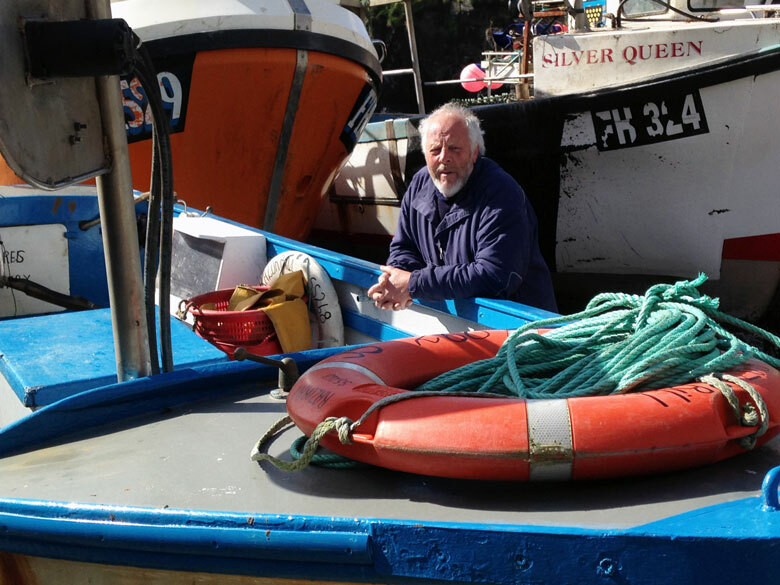 While Nigel works on his own, he says most local fishermen fish in pairs from bigger boats. When he started out in the industry they would all sign on to the dole during the winter until changes to the rules stopped this. 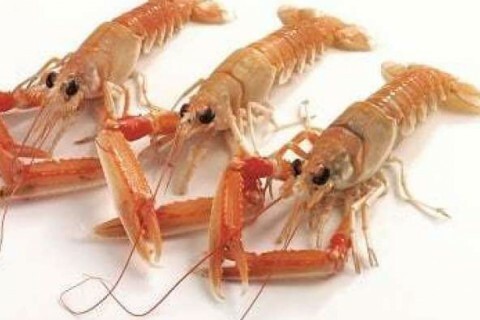 Now other fishermen tend to keep fishing throughout the year and will head out in rougher weather. 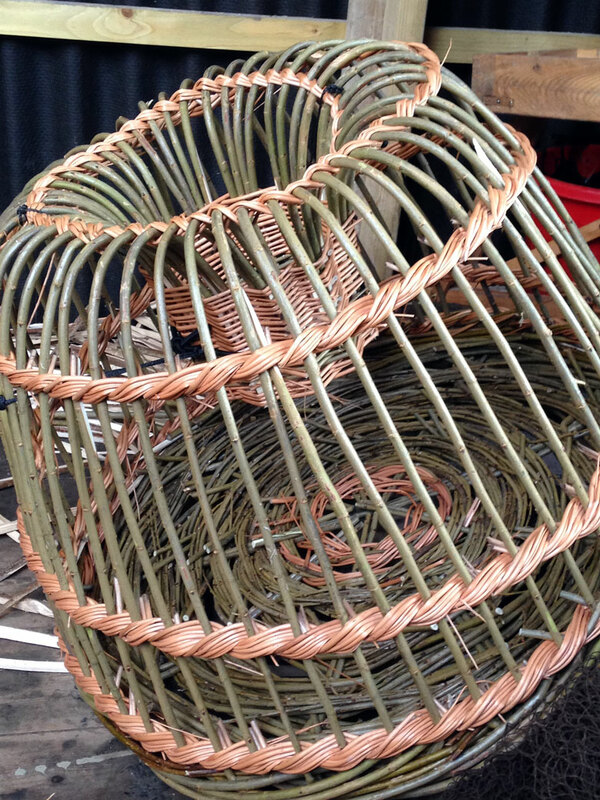 But Nigel saw an opportunity to make a secondary living on land by reviving the old skill of weaving willow pots. 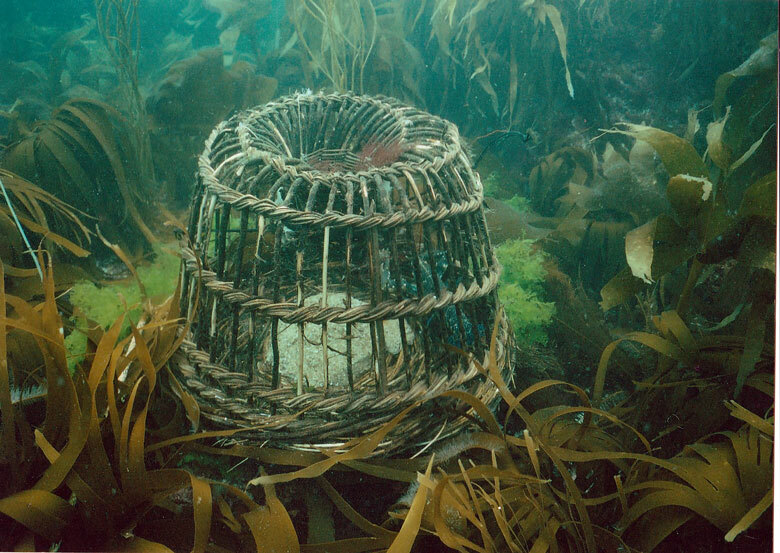 It wasn’t until someone asked him to make a traditional lobster pot for decoration that Nigel saw there might be a new market. Now he makes about 200 every winter, selling most as props for television and film – including the recent BBC Poldark series – and decorative items. He cuts some willow himself locally, but mainly sources it from Somerset. Weaving is not easy work and Nigel admits that as a boy he hated the task. But he now sees it as an art form – although his father would be horrified at the thought. He also believes that their natural material makes willow pots quicker at attracting lobster and crawfish than steel or plastic alternatives. But although he puts some out himself and sells a few to casual fishermen, he explains they’re no longer viable on a large scale. However, as Nigel has proved, they can provide a valuable second income for fishermen, and he is keen to see the skill live on in Cadgwith. Although he has seen cheap imitations manufactured in China from raffia and cane, Nigel says genuine willow pots can only be hand-woven, and he can never make enough to meet demand. 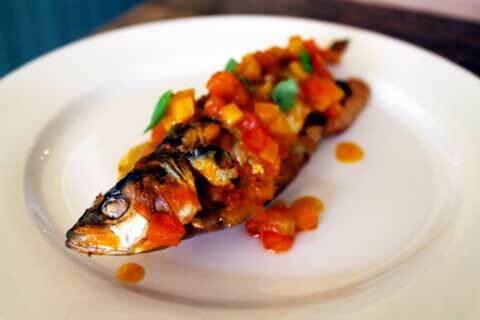 Chef Tom Symons’ perennially popular step up from sardines on toast is really easy to make and the sauce can be prepared in advance for the minimum of last-minute fuss.